WKCR Classical is pleased to announce a 48-hour broadcast to celebrate the bicentennial of Giuseppe Verdi's birth. 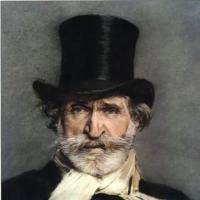 Steeped in the bel canto tradition of 19th century Italian music, Verdi built upon his predecessors' while reshaping the face of opera entirely. The two-day festival will explore his most celebrated masterpieces, but will also highlight his lesser known works, from his first operas to chamber music. Some of today's greatest musicians and scholars, such as Maria Guleghina and George M. Martin, will speak about the composer's work and influence. The broadcast is from October 8th through October 9th. FULL SCHEDULE BELOW.